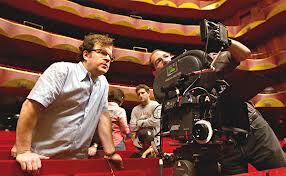 Director Kenneth Lonergan behind the scenes of Margaret (2011). Image courtesy of http://www.nytimes.com. Now, I have never been to the opera, so I cannot speak from personal experience on what a “typical production style” looks like. Even if I had, I wouldn’t pretend to know what a “typical” one is, either. Instead, I would defer to this expert critic, but I find many points in his argument totally unconvincing. Read on if you wish to learn How Hollywood Films Can’t Possibly Be Killing Opera. First of all, in generalizing about the state of opera today, Woolfe says that it’s all about putting on old favorites by Puccini and Verdi in order to get butts in seats, butts whose owners have come to think of a night at the opera as a special, gown-wearing event (given Julia Roberts’s wardrobe choice). The problem is, Woolfe offers no statistical data to support this claim. He provides no quantitative analysis to measure where and how often the “popular” operas are put on these days. Likewise, he offers neither the bottom lines from box office receipts nor demographic surveys of the audiences. Just who does he think is going to the opera? Only Moonstruck fans? Without the cold, hard numbers to prove that movies such as Pretty Woman have dictated opera companies’ programs and opera-going audiences’ tastes, Woolfe can hardly blame Hollywood for ruining opera. Woolfe’s polemic appeared online August 16th, and since then The Washington Post‘s Philip Kennicott published a feature story on the wide-ranging, lesser known works that the Santa Fe Opera has selected for production to satisfy the “serious” opera-lover. Understandably, the company is world-famous and attracts big names for starring roles, and thus it probably costs a small fortune to attend one of their productions. Someone who is a season ticket-holder at Santa Fe probably doesn’t care about the scenes in Moonstruck wherein Nicolas Cage and Cher go to the opera. In any case, Kennicott’s piece serves as an in-depth corrective to Woolfe’s foolish generalization that the opera “landscape is overwhelmingly drab.” So, cheer up, Woolfe. It doesn’t look that bad. Moreover, Woolfe’s implicit definition of Hollywood is also problematic, for Margaret, which he spends the second half of his article lambasting (full disclosure: I haven’t seen it yet), is emphatically not a “Hollywood” picture. If he was going to include films produced outside the American film industrial complex anyway, Woolfe should have taken a look at Mike Leigh’s opulent costume drama Topsy-Turvy (1999), which chronicles the production of Gilbert & Sullivan’s 1885 comic opera The Mikado. If that film doesn’t give the spectator a deeper appreciation for all the minute decisions that go into making an opera—everything from searching for inspiration and blocking stage movements while dressed in unusual costumes to rehearsing difficult-to-pronounce lyrics—then I don’t know what will. Besides, all the films that Woolfe invokes are not about opera; they merely contain a scene or two depicting the protagonists attending an opera and/or feature operatic leitmotifs on the sound track. So why does he let these film scenes ruin opera for him? 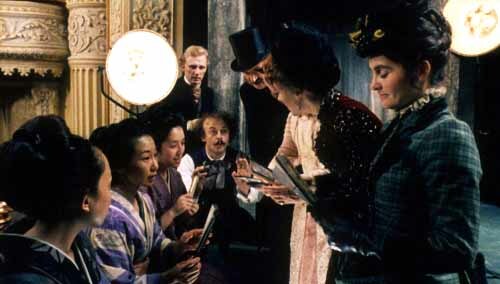 The cast and crew seek the help of some Japanese actresses in rendering Gilbert & Sullivan’s comic opera The Mikado in the Mike Leigh film Topsy-Turvy. Image courtesy of http://www.brightlightsfilm.com. Woolfe doesn’t like that the date nights at the opera featured in Moonstruck, Pretty Woman, and Margaret lead film audiences to assume that opera-going is only an occasion for dressing up to the nines, to escape the everyday. While he doesn’t find the opera performance in 1986’s Hannah and Her Sisters “exactly innovative” (it’s Puccini again), he wishes that other filmmakers would follow Woody Allen’s lead in representing opera attendance as “no big deal,” something as banal as going to the movies, say. This seems counter-intuitive to me. Clearly, opera and opera-going are very “big deal[s]” for Woolfe. Shouldn’t he be pushing for more evocative scenes in films that showcase opera in a heretofore different light? Furthermore, if good art should inspire a transcendental experience in those who encounter it, maybe even going so far as to help a person forget she’s had a bad day, then why is Woolfe decrying film’s representation of opera as “escapist”? Why does he want opera and opera-going to appear in film just as any other interest or activity does? How will that make opera an any more relevant or essential experience we should seek out? Besides, don’t tell me it’s socially acceptable to wear jeans and a t-shirt to the opera. Going to the opera isn’t like attending a baseball game or even a musical play. It’s still largely cost-prohibitive, I bet. So going to the opera is a special occasion. I didn’t grow up in a home that waxes rhapsodic about the virtues of opera, but I can appreciate them from afar, on an intellectual level. I may not know anything about individual operas (I defer to my dad on the subject whenever the category appears on Jeopardy! 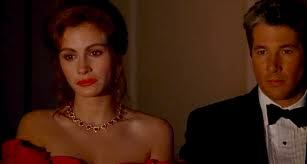 ), but I know enough to know that opera is not as it is portrayed in Moonstruck and Pretty Woman. So don’t be so condescending, Woolfe. But what do you think? Is Woolfe exaggerating the effect movies have on opera today? I attended performances at the Metropolitan Opera about 6 times last year and will do so this year. I love opera enough and am fortunate enough to buy good expensive seats. I always wear jeans. True some people do dress up, but that typically means a nice dress for woman and a suit for a man. Most of time you see people in evening gowns and tuxes, they are 1%-ers attending new production premieres. The Mikado is not an opera; it is an operetta and would never be presented at the Met and other major opera houses. It is an example of the kind of lighter fare that smaller opera companies are presenting to attract audiences, as mentioned in the article about the Santa Fe Opera (the Santa Fe Opera being a big exception to that). It is true that the Met does lots of old war horses usually with very conventional productions, just as Woolfe says.